Sandals’ credibility died when German tourists co-opted them abroad. Like the cargo shorts Düsseldorf natives so often pair them with, sandals are a victim of their own design. Sturdy and breezy, they make perfect sense when you’re strolling over sun-scorched pavements. And because fashion hates function, that utility means they’re also adept at killing looks. Or, at least, they were. In one of the biggest menswear turnarounds since David Beckham, men’s sandals have become a bona fide trend. At Bottega Veneta, that bastion of Italian style, dual-strap sandals were even paired with chunky socks. Imagine. Don’t mistake that as a tip-off to visit a mountaineering store, though. Where your dad favours sweat-inducing nylon and plastic, the front row’s version is all natural. “Soft leathers are good, because they’re breathable,” says Giles Farnham, head of River Island’s Style Studio. “They tend to give a lot, so choose a snug pair.” But nothing so cosy your toes hang over the end. That said, not all Jesus treads are heaven-sent. “Black or brown leather is preferable over bright colours,” says stylist Alex Longmore. 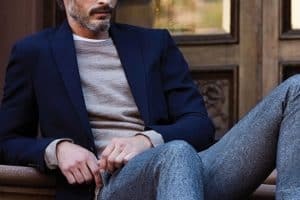 “Not only will they pare down on any potential statement, but they’re also better-suited to more conservative staples.” Which means your look should be more cuffed trousers and chinos as opposed to Koh Phangan fluoros, with low-key cotton-linen suits and crisp tees taking centre stage. Most importantly however, make sure your trotters are deserving of some new treads. “Go for a pedicure,” says Farnham. “It’s a moment of discomfort for feet that are actually worth seeing.” Once your feet are ready for display, these are the best sandals to be seen in. Birkenstock: the only sandals to be embraced by the German tourist, Soho House hipster, college lecturer holy trinity – and with good reason. Every single pair boasts a contoured, malleable footbed for better comfort, all housed within a classic, easy-to-wear shape. Available at Amazon, priced £44.93. Clarks has come up trumps in recent years, and for that we can thank traditional designs, quality leather and affordable price tags – three things that are also applied to its sandal line, too. Available at Clarks, priced £60. Don’t get it twisted: caged sandals are more Gladiator than Girl Guide these days. To achieve a balance of form and function, Camper takes cue from its outdoors-heavy history to pare down on any potential Big Statement. Available at Camper, priced £86. Fishermen sandals should be of the Grecian variety, and not a trawlerman off the Mull of Kintyre. River Island’s option net the perfect balance, adding enough detail to the thatched upper without looking like a Hercules throwback. Available at River Island, priced £28. The Greeks don’t deserve full credit, though. Like so much of its collection, Dolce & Gabbana looks to Sicily for its simple sandal collection – a decidedly muted move from a brand known for pearl-encrusted headphones. Available at Matches Fashion, priced £395. Functional needn’t read nerd. Teva has long produced sandals that, for all intents and purposes, are more suited to ornithologists than on-point dressers, yet a lack of toggles and visible velcro make these sandals fit for stylish purpose. Available at Teva, priced £55. If style has naturally progressed to utilitarian designs of late, then Suicoke has very much led from the front. 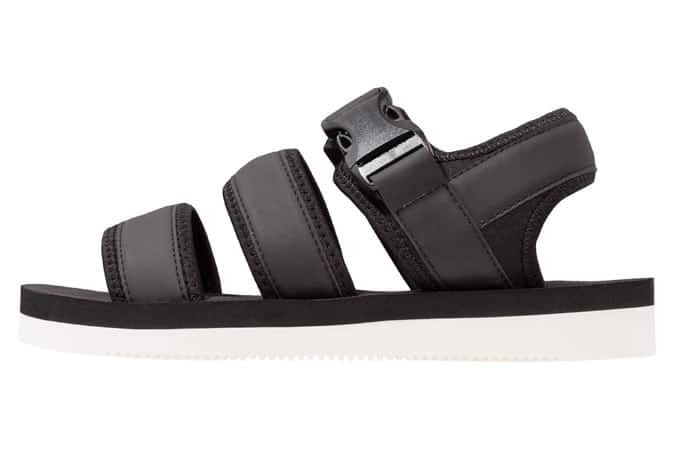 The cult Japanese label fuses minimalism with outdoorsy design, resulting in a very modern sandal indeed. Available at End, priced £195. With a home in London’s Oxford Street, Dune know a thing or two about what shoppers actually want. Case in point, the British retailer’s range of sandals, a simplistic offering that can be dressed up or down as appropriate. Available at Dune, priced £55. Despite the Hedi Slimane switch to rockstar aesthetics, Saint Laurent has been a leader in painstakingly-crafted sandals that should be kept far, far away from an actual rock concert. Available at Farfetch, priced £425. Canada and Morocco aren’t the most obvious of footwear homelands, yet Aldo brings both countries to the forefront thanks to a range of solid kicks. Which, thankfully, includes practical but stylish sandals for your summer, wherever you’re venturing. Available at Zalando, priced £25.99.